Rhode Islanders were pretty pleased with their royal charter in 1663, which granted them freedom from religious persecution. 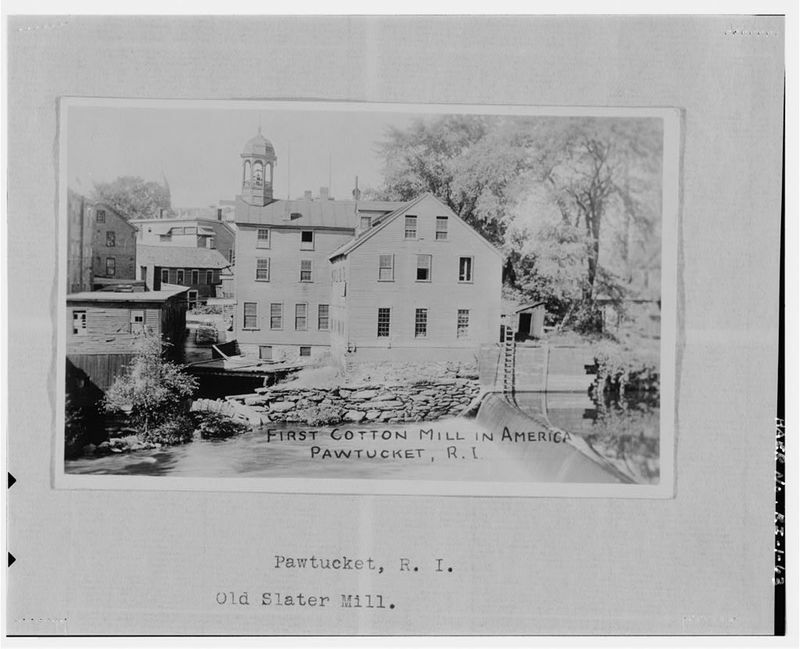 But even a beloved antique can lose its luster eventually, and so by the 19th century, when Rhode Island still operated under the charter (which included no means to amend it in any way), citizens were justifiably ready for a change. Not surprisingly, the Rhode Island of the nineteenth century was a far cry from that of the seventeenth. No longer a collection of sleepy farming communities, roaring centers of industry had emerged, attracting new waves of immigrants eager to fill factory jobs. Despite major population booms in Rhode Island’s urban sectors, these areas received the same representation in state government as the sparse rural towns. The other inequality that most stuck in the craw of some Rhode Islanders was the issue of suffrage, or the right to vote. But there were many in the state who wanted to hold onto their voting power, namely mill owners opposed to reform and conservative rural Democrats, who had much to lose if their interests were overshadowed by an onslaught of city voters. Many contemporary critics saw through to the deeper issue at hand: most of the urban voters would be immigrants, and the tide of anti-immigrant hatred was only growing. The conflict in 1841-42 pitted two parties against one another: the Charterites, or the Law and Order Party, led by then-governor Samuel Ward King, who wanted to stick with the charter and keep close tabs on who deserved the privilege of voting; and the People’s Party, spearheaded by a Harvard-educated lawyer and former state legislator named Thomas Wilson Dorr. The frustration over inequalities in representation and voting that had been brewing for some time came to a head in 1841 when the Rhode Island Suffrage Association charged Thomas Wilson Dorr with drafting a new constitution to usher in a new political order. In early 1842, two separate elections were held, one naming Dorr governor, and the other, Samuel Ward King. After a trip to New York persuaded Dorr to resort to force to gain the advantage, he and his followers unsuccessfully attempted to overtake an arsenal with cannons that misfired. Dorr fled the authorities through Connecticut and into New York, returning to Rhode Island in June where he attempted to reconvene his People’s legislature and gather forces in Chepachet. When Charterite militia marched on the village, they discovered that Dorr’s troops had already retreated. No battle took place, but many Dorr supporters were arrested. Dorr fled again, this time to New Hampshire. He eventually returned and was tried for treason and sentenced to life in prison (though he served only one year of the sentence). Although the Dorrites had been unsuccessful in the short term, the cause for suffrage had gained such support that a new constitution was drafted and adopted in 1842, going into effect in 1843. In this iteration, suffrage was extended to any native-born male, including Black men, regardless of property holdings. In truth, though, it was no great victory for the Dorrite cause: the new constitution disenfranchised non native-born citizens as well as Narragansett Indians. Rhode Island's Royal Charter: This image shows Rhode Island's Royal Charter of 1663, which is currently on display at the State House. 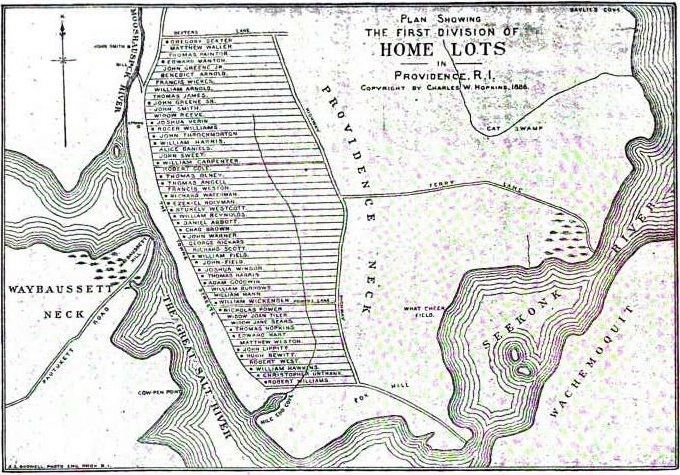 A Map of Early Providence: This image shows the early home lots of Providence colonists in the seventeenth century. Despite the continued influx of immigrants to Rhode Island throughout the nineteenth century, a land qualification prevented many of them from voting until the Bourn Amendment to the state constitution in 1888 removed this barrier. Click here for a lesson plan that provides an overview of the 1841-42 conflict. Elyssa Tardif, “The Dorr Rebellion - Context,” Rhode Tour, accessed April 21, 2019, http://rhodetour.org/items/show/224.